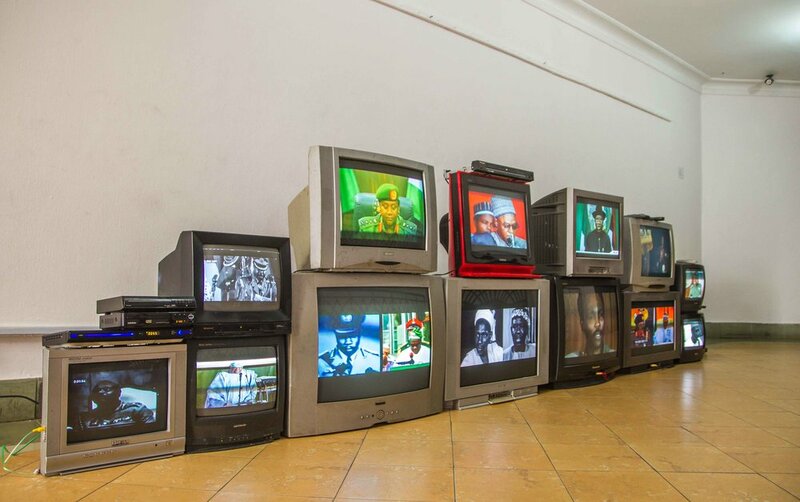 Power Show II: The God-Fathers Are Not To Blame is a multi-layered exhibition of sculpture, sound, video, and digital archives, as a means to address the vexed relationship between leadership and citizenship in Nigeria. The project focuses on the “voice of the people” through the ongoing registry I have taken as a form of digital activism, from the sound installation made from audio recordings at newspaper stands in areas on the mainland and island in Lagos, to screenshots of opinions, commentary and statements made by individuals on social media concerning the state of Nigeria. The title of the exhibition draws from The Gods Are Not To Blame, the 1968 adaptation of the Greek classic, Oedipus Rex by Nigerian playwright and novelist, Ola Rotimi. A central theme in both plays is fate and/or destiny which allude to the parallels that exist between Greek and Yoruba epistemology. The plays also highlight the polytheistic practices of both theologies as they engage a fluid concept between the divine and the human, in addressing issues such as agency and control which completely differs from modern post-enlightenment epistemologies. Democracy has its roots in ancient Athens and while there seems to be a consensus that the democratic process and its system of governance is the ideal that nations must strive toward, due to the freedom of its citizens – its meaning however has been re-defined by different governments. Nigeria, and most African nations who began a post-colonial journey in the late 1950’s to the early 1960’s, had its democratic systems interrupted by military coups and counter coups, political rifts, civil wars, foreign interventions in domestic affairs and internal chaos. But the end of the cold war ushered in a new era of democratic experimentations by most third world countries, as the military influences wane, democratic societies became main stream in these nations - the freedom that is ascribed to this system has become an illusion to many, and a reality to the political elite. This exhibition critiques the role of the political elite in using democracy as a pretext for perpetuating neo-colonial agendas. It further traces the emergence of the Oedipus myth as the archetype of patriarchy in western epistemologies and its subsequent imposition on pre-colonial African empires which became the foundation for a post-independence patriarchal society. While the term “God-father” takes its origin from Judeo-Christian practices, where parents choose an individual to bear witness to the child’s baptism, the focus in this exhibition is on the subject of political Godfathers and the use of its machinery to foster classism. The concept of “Godfatherism” – a form of political corruption in which an influential member of a party influences the ascension to leadership and electoral positions on the party delegates and the electorates. 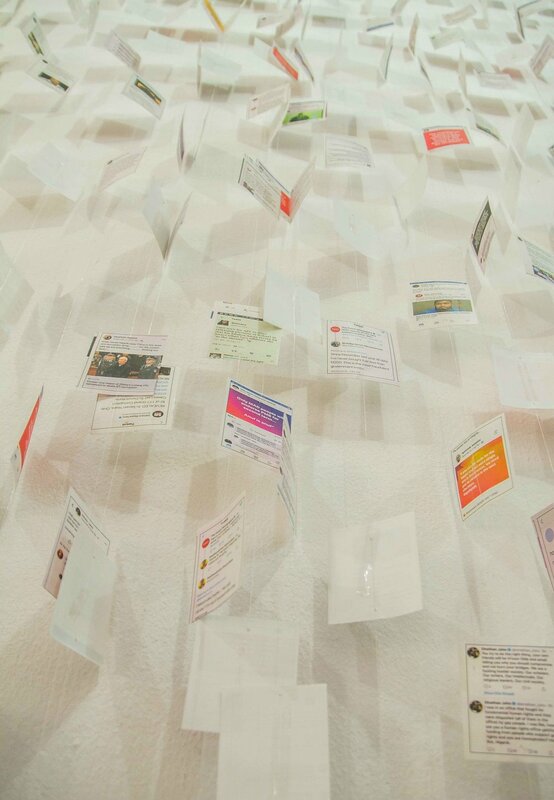 While this exhibition poses more questions than answers, the role of the people in challenging this form of political patriarchy and establishment is brought to the fore with the sound and social media installations: both archives of ‘the voice of the people’, instrumentalized in this instance for activism - and in so doing centralizing the role of digital activism in movements/calls for change. The architecture of the gallery space becomes central to my attempt to evoke both intimacy and the monumental. While its position in the fire exit of a public building, demands quickness, the works on the other hand slow down the viewers – to see, to think, and interrogate, as each of the three gallery floors allude to the different layers in our contemporary socio-political discourse. 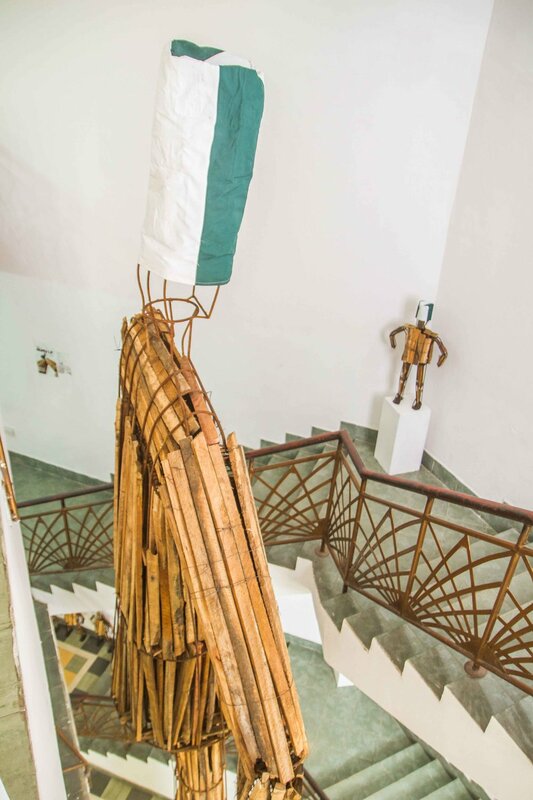 With the opening on the 1st of October, amidst celebrations of the country’s 58th anniversary of independence and the 2019 election campaign period, the exhibition aims to stimulate political consciousness and action amongst the citizenry in a period laden with political campaigns and electioneering.